For the British singer and manager, see Larry Page (British singer and manager). Lawrence "Larry" Page (born March 26, 1973) is an American computer scientist and industrialist who, with Sergey Brin, is best known as the co-founder of Google. 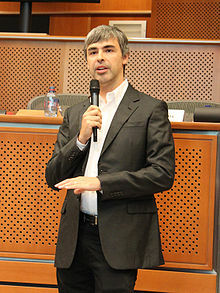 He is also the current Chief Executive Officer of Google, as announced on January 21, 2011 through a blog post. As of 2011[update], his personal wealth is estimated to be $19.8 billion. Page was born in East Lansing, Michigan. His father, Carl Page, earned a Ph.D. in computer science in 1965 when the field was in its infancy, and is considered a "pioneer in computer science and artificial intelligence." Both he and Page's mother were computer science professors at Michigan State University. Page is Jewish on his mother's side, and was raised without religion. Page attended the Okemos Montessori School (now called Montessori Radmoor) in Okemos, Michigan from 1975 to 1979, and graduated from East Lansing High School in 1991. He holds a Bachelor of Science degree in computer engineering from the University of Michigan with honors and a Masters degree in computer science from Stanford University. While at the University of Michigan, "Page created an inkjet printer made of Lego bricks" (actually a line plotter), served as the president of the HKN in Fall 1994, and was a member of the 1993 "Maize & Blue" University of Michigan Solar team. During an interview, Page recalled his childhood, noting that his house "was usually a mess, with computers and Popular Science magazines all over the place." His attraction to computers started when he was six years old when he got to "play with the stuff lying around." He became the "first kid in his elementary school to turn in an assignment from a word processor." His older brother also taught him to take things apart, and before long he was taking "everything in his house apart to see how it worked." He said that "from a very early age, I also realized I wanted to invent things. So I became really interested in technology...and business . . . probably from when I was 12, I knew I was going to start a company eventually." After enrolling for a Ph.D. program in computer science at Stanford University, Larry Page was in search of a dissertation theme and considered exploring the mathematical properties of the World Wide Web, understanding its link structure as a huge graph. His supervisor Terry Winograd encouraged him to pursue this idea, which Page later recalled as "the best advice I ever got". Page then focused on the problem of finding out which web pages link to a given page, considering the number and nature of such backlinks to be valuable information about that page (with the role of citations in academic publishing in mind). In his research project, nicknamed "BackRub", he was soon joined by Sergey Brin, a fellow Stanford Ph.D. student. "At the time Page conceived of BackRub, the Web comprised an estimated 10 million documents, with an untold number of links between them. The computing resources required to crawl such a beast were well beyond the usual bounds of a student project. Unaware of exactly what he was getting into, Page began building out his crawler. "The idea's complexity and scale lured Brin to the job. A polymath who had jumped from project to project without settling on a thesis topic, he found the premise behind BackRub fascinating. "I talked to lots of research groups" around the school, Brin recalls, "and this was the most exciting project, both because it tackled the Web, which represents human knowledge, and because I liked Larry." Brin and Page originally met in March 1995, during a spring orientation of new computer Ph.D. candidates. Brin, who had already been in the program for two years, was assigned to show some students, including Page, around campus, and they later became good friends. To convert the backlink data gathered by BackRub's web crawler into a measure of importance for a given web page, Brin and Page developed the PageRank algorithm, and realized that it could be used to build a search engine far superior to existing ones. It relied on a new kind of technology that analyzed the relevance of the back links that connected one Web page to another. In August 1996, the initial version of Google was made available, still on the Stanford University Web site. In 1998, Brin and Page founded Google, Inc. Page ran Google as co-president along with Brin until 2001 when they hired Eric Schmidt as Chairman and CEO of Google. In January 2011 Google announced that Page would replace Schmidt as CEO in April the same year. Both Page and Brin earn an annual compensation of one dollar. On April 4, 2011, Page officially became the chief executive officer of Google, while Schmidt stepped down to become executive chairman. Page married Lucinda Southworth at Richard Branson's Caribbean island, Necker Island in 2007. Southworth is a research scientist and sister of actress and model Carrie Southworth. He has one child. Page is an active investor in alternative energy companies, such as Tesla Motors, which developed the Tesla Roadster, a 244-mile (393 km) range battery electric vehicle. He continues to be committed to renewable energy technology, and with the help of Google.org, Google's philanthropic arm, promotes the adoption of plug-in hybrid electric cars and other alternative energy investments. Brin and Page are the executive producers of the 2007 film Broken Arrows. In 2003, both Brin and Page received an honorary MBA from IE Business School "for embodying the entrepreneurial spirit and lending momentum to the creation of new businesses...." And in 2004, they received the Marconi Foundation Prize, the "Highest Award in Engineering," and were elected Fellows of the Marconi Foundation at Columbia University. "In announcing their selection, John Jay Iselin, the Foundation's president, congratulated the two men for their invention that has fundamentally changed the way information is retrieved today." They joined a "select cadre of 32 of the world's most influential communications technology pioneers...." He was elected to the National Academy of Engineering in 2004. In 2005, Brin and Page were elected Fellows of the American Academy of Arts and Sciences. In 2002 the World Economic Forum named Page a Global Leader for Tomorrow and in 2004 the X PRIZE chose Page as a trustee for their board. PC Magazine has praised Google as among the Top 100 Web Sites and Search Engines (1998) and awarded Google the Technical Excellence Award, for Innovation in Web Application Development in 1999. In 2000, Google earned a Webby Award, a People's Voice Award for technical achievement, and in 2001, was awarded Outstanding Search Service, Best Image Search Engine, Best Design, Most Webmaster Friendly Search Engine, and Best Search Feature at the Search Engine Watch Awards." In 2004, Page and Brin were named "Persons of the Week" by ABC World News Tonight. Page received an honorary doctorate from the University of Michigan in 2009 during graduation commencement ceremonies. In 2011, he was ranked 24th on the Forbes list of the world’s billionaires and as the 11th richest person in the United States. ^ a b c Forbes Magazine (2011). "Larry Page". Forbes Magazine. http://www.forbes.com/profile/larry-page. Retrieved March 10, 2011. ^ Larry Page (1999). "Lawrence or Larry Page's Page". Stanford Web Site. http://infolab.stanford.edu/~page/. Retrieved May 18, 2010. ^ "Statement From Eric Schmidt on Google CEO Change". The Wall Street Journal. January 20, 2011. http://blogs.wsj.com/digits/2011/01/20/statement-from-eric-schmidt-on-google-ceo-change/. ^ "HKN College Chapter Directory". Eta Kappa Nu. January 15, 2007. http://www.hkn.org/admin/chapters/beta_epsilon.html. ^ a b c d e f g Battelle, John. "The Birth of Google." Wired Magazine. August 2005. ^ "Larry Page Profile". Google. http://www.google.com/corporate/execs.html#larry. ^ Efrati, Amir (January 21, 2011). "Google's Page to Replace Schmidt as CEO". The Wall Street Journal. http://online.wsj.com/article/SB10001424052748704881304576094340081291776.html?mod=googlenews_wsj. ^ Google founder Larry Page to marry, Reuters. ^ McCarthy, Megan. "President Bush, Clintons to meet at Googler wedding?" ValleyWag.com December 7, 2007. ^ Coleridge, Daniel R. "Night Shift's Model MD." SOAPnet.com. July 16, 2008. Retrieved September 10, 2008. 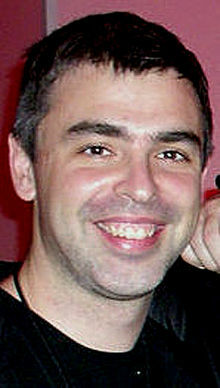 ^ Google Co-Founder Page to Wed, The Associated Press. ^ National Science Foundation, Fellow Profiles. ^ "Larry Page's University of Michigan 2009 Spring Commencement Address=2009-10-6". http://www.google.com/intl/en/press/annc/20090502-page-commencement.html. Short description Co-Founder & President of Products of Google Inc. This page was last modified on 24 April 2011 at 14:46.